I was in Kiev for 3 weeks at the end of March to the first week of April. 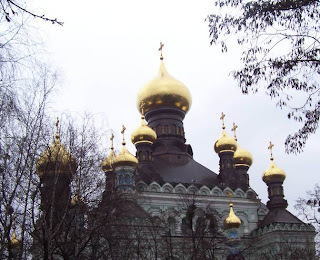 What caught my eye even in gloomy late winter weather were the golden cupolas of the Russian Orthodox churches. 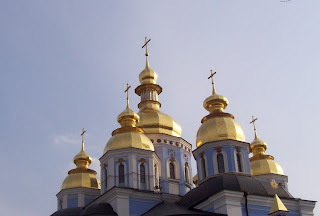 And Kiev has a quite a few of these churches. From up close, they look like gold onion bulbs plastered with individual gold candy foil. Rain or shine, they just keep looking mighty golden. I asked around in the little office I worked out of how they kept them so shiny. Antonina, said with a laugh: rain and wind. The rain washes, the wind polishes. The first set of cupolas belong to a nunnery whose name escapes me but it was next to the office building. The office is in the university hostel of the pedagogical institute off Artema St., across fhe lane from the US consulate. The nunnery I believe is a few hundred years old and it looks its age. The next set belongs to St. Michael's Church, on Michailivs'ka in downtown. The church is vintage 1990's reconstructed on the old site. The communists tore down the original church (or cathedral, I'm not sure) in the 1930's to make way for government buildings of the old Soviet Union. Luckily, the communists never had the chance to build their utilitarian offices. After the disintegration of the Soviet Union, St. Michael's, like the phoenix, rose from the ashes. 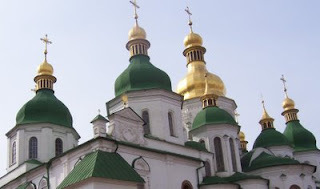 Finally, the mother of all churches in Kiev, St. Sophia's Cathedral, which dates back to the 10th century. and represents the historical foundation of Kiev. In the cathedral grounds are museums, a nice park and a bell tower. There's entrance fee to get inside the grounds, another fee to get to the church museums, and another to go up the bell tower. St. Michael's, however, was free to the public. The nunnery, I wasn't sure if it was open to the public but I enjoyed seeing its gold onion bulbs every working day.